Shares of Blue Apron Holdings Inc. (NYSE:APRN), a meal delivery service that creates original recipes and delivers fresh ingredients directly to consumers' doorsteps, popped 17% higher as of 2:11 p.m. EST Thursday and are continuing to run higher following the company's announced partnership with Weight Watchers International (NASDAQ:WTW). In case you missed the news over the holidays, WW and Blue Apron formed a partnership that will feature a weekly rotating collection of recipes with high-quality ingredients, as well as unique flavors developed in collaboration with WW nutrition and wellness experts. The customized WW menu will have six new meals rotating weekly throughout the year and will be an extension of Blue Apron's core meal menu. "Our new WW Freestyle menu is designed to bring discovery and achievement to the home cooking experience, introducing consumers––including WW members and Blue Apron customers––to ingredients, techniques, and delicious meals that empower them to develop a wellness-inspired home cooking routine." said Brad Dickerson, CEO, Blue Apron, in a press release. The question for investors remains: Will this development help turn the business around? While details of the financial partnership were scarce, Blue Apron will pay WW fees for resulting subscriptions, and if the partnership helps bring in customers at a lower cost than Blue Apron's traditional marketing, it could prove to be a valuable partnership. In fact, Dickerson said this partnership with WW will help make Blue Apron profitable next year. 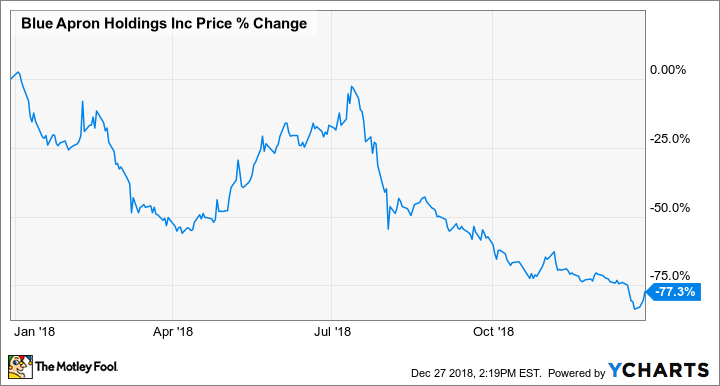 This is a positive development for investors, no doubt, but it's worth keeping in mind just how far the company has fallen -- as you can see above -- as it all but admitted its business model wasn't working. One thing is clear: There is much work to be done before Blue Apron is an enticing long-term investment.